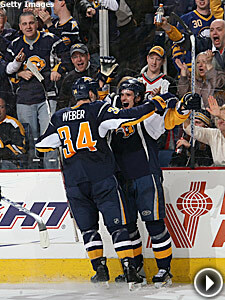 Andrej Sekera’s goal 39 seconds into OT helped the Sabres beat the Bruins 2-1. Not Dead Yet -- The Buffalo Sabres’ overtime win over the Boston Bruins Sunday was reminiscent of that classic scene from Monty Python and the Holy Grail. While some are under the impression that the Sabres are in fact dead, Buffalo’s feeling fine – at least for now. Andrej Sekera’s goal 39 seconds into the extra session extended the Sabres’ playoff hopes for another day in a 2-1 victory. With only two games on the slate Monday night, the Sabres will still be alive Tuesday morning, too. But as the week progresses, it’s going take a miracle for the Sabres to earn a return trip to the postseason. "We're not going to get ahead of ourselves," Buffalo goalie Ryan Miller said. "We're going to need some help, but we have to help ourselves first or else it's all a moot point." Meanwhile, the Chicago Blackhawks find themselves in a similar situation as the Sabres. Patrick Kane’s goal in the shootout gave Denis Savard’s club a thrilling 5-4 win over the Columbus Blue Jackets at the United Center. The win pulled the Blackhawks within four points of a playoff spot in the Western Conference with three games to play. "We made some adjustments, just shot pucks more," Savard said after watching his team rally from a 3-1 deficit. "That's all we talked about, and we capitalized." Columbus, Phoenix Eliminated -- Two more teams found out on Sunday that they are going home for summer, as the Columbus Blue Jackets and Phoenix Coyotes came up short in their bids to keep their slim hopes alive. Columbus surrendered 3-1 and 4-3 leads in its 5-4 shootout loss to the Chicago Blackhawks. The Blue Jackets have never reached the Stanley Cup Playoffs since entering the NHL in 2000. "There's nothing like winning, that's how simple it is," Columbus goalie Fredrik Norrena said. "If you don't play your heart out in this League, you don't belong here." The Coyotes got off to a rough start in their 3-1 loss at San Jose Sunday. Joe Thornton beat Ilya Bryzgalov just 14 seconds into the game. Phoenix has lost seven of its last eight games to fall right out of the race. "We've had a nice turnaround this season with our young players," Coyotes coach Wayne Gretzky said. "A week ago, we were right in the thick of things to make the playoff race. Nobody really anticipated that or expected it. ... This has been a tough three or four games for us because they battled so hard all year, (and) all of sudden you're out of it. That's made it tough. I talked to them today, and I told them that you have to have pride in yourself and show up and play hard." Foreclosing On No. 4 -- The Anaheim Ducks have all wrapped up home-ice advantage for the opening round of the Stanley Cup Playoffs. That’s bad news for whoever their opponent turns out to be. Ducks goalie Jean-Sebastian Giguere blocks the shot of Stars' forward Jere Lehtinen during a shootout to defeat the Stars 3-2. With Sunday’s 3-2 shootout win over the Dallas Stars at the Honda Center, the Ducks set a franchise record with their 27th home victory of the season. They’ve won 11 of their last 12 games in Orange County and have moved to within two points of clinching the fourth seed in the Western Conference. There’s also a decent chance that the Ducks could meet the Stars – who currently sit in the No. 5 position – in the first round of the postseason. Anaheim defenseman Mathieu Schneider is pleased to know that series is more than likely to begin at the Honda Center, where the Ducks are 18-3-1 in their last 22 games. “They are one of the elite teams in the Western Conference,” Schneider said of the Stars. “If we do end up playing them, it’s going to be a battle. If we can get home ice, that’s a big bonus for us. We put ourselves in a positive that we might be able to." Dallas may be one of the elite teams in the West, but it sure didn’t perform like it in March, as the Stars went 2-7-2. Only Eliot Spitzer had a worse month. Sorry, Gordie -- Just hours after they honored Gordie Howe as he celebrates his 80th birthday today, Johan Franzen broke one of the Hall of Famer’s records. Franzen’s goal at 3:21 of overtime broke a scoreless tie as the Detroit Red Wings earned a 1-0 victory over the Nashville Predators. The goal was Franzen’s sixth game-winner in March, which set a new franchise record for the most in a month. Real nice, Johan. What’s next … trick candles on his birthday cake? Rangers goalie Henrik Lundqvist makes a glove save on Penguins forward Petr Sykora yesterday afternoon. Rangers Need Two Points -- The New York Rangers left Pittsburgh on Sunday still in decent shape as far as the postseason race is concerned. But the Blueshirts would really be helping themselves if they could find a way to salvage a split of this home-and-home series with the Pens. New York enters Monday night’s action tied with both the Boston Bruins and Philadelphia Flyers with 91 points apiece. That’s three teams for the sixth, seventh and eighth spots, and the Washington Capitals are banging on the door with 88 points. Rangers coach Tom Renney clearly understands the importance of Monday’s rematch with Pittsburgh. "Every game that passes by that you don't get points in, it becomes that more crucial,” Renney said. "There are some very good hockey teams chasing playoff spots right now, and we have one, and it's not a divine right. It's something we have to earn to keep. And we'll have to do that (Monday)." If they don’t, things could get really interesting later this week. I wonder what the crowds at Nassau Coliseum and MSG would be like on Thursday and Friday. Gaborik Reaches 40 -- Congratulations to Minnesota Wild forward Marian Gaborik, who reached the 40-goal plateau for the first time in his career in dramatic fashion Sunday. No. 40 came 3:10 into overtime in a 3-2 win over the Colorado Avalanche, a victory that increased Minnesota’s lead in the Northwest Division to four points. A division title would give the Wild the No. 3 seed in the Western Conference. Detroit’s win over Nashville assured the Wild of a playoff spot, but Minnesota now has its eyes set on the division crown as we enter the final week of the regular season. "I don't think there was any doubt in any of our minds that we'd make the playoffs," Wild forward Brian Rolston said. "We're trying to stay on top of our division right now, that's our main focus." Old Man Winner -- It was a feel-good moment at GM Place on Sunday night, as grizzled veteran Trevor Linden scored twice in under five minutes in the second period of a 6-2 win over the Calgary Flames. Vancouver Canucks goalie Roberto Luongo stops Calgary Flames' forward Dustin Boyd during third period last night at GM place. It has been more than five years since Linden – a healthy scratch 23 times this season – had scored twice in a game, and he couldn’t have picked a better night to accomplish the feat. The victory put the Canucks one point ahead of the Nashville Predators for the eighth and final playoff spot in the Western Conference. Vancouver coach Alain Vigneault was pleased to see Linden get rewarded after doing the dirty work in front of the net. 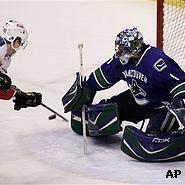 Linden’s second goal of the night promoted Flames coach Mike Keenan to replace Miikka Kiprusoff with Curtis Joseph. "That's how you score the goals," Vigneault said. "You've got to go to the tough areas, and a lot of times, you've got to take a lot of abuse and that's what he did." The best part of the night for Linden may have very well been being named the game’s No. 1 star – which was followed by a huge ovation from the capacity crowd at GM Place. "I didn't exactly know what I was supposed to do, it's been a while since I was first star," Linden joked. "The fans hadn't seen me for a long time after a game, so it was pretty special."